And so it’s that time of year again: Conclave! And with players of various games travelling to Thomond Park to enjoy the wonderful weekend, it was going to be one to enjoy. With the YuGiOh! Main event starting on the Saturday morning, there was little time to sit still as we were all go immediately. As soon as the doors opened, players were pouring in ready for a day of competitive fun. By the time registration ended, we had some of Irelands best ready to compete for the first place prize of a flight! Round 1 began, and with the help of Brendan Cross (Limerick’s new judge) everything ran smoothly. Deck lists were collected, the few rulings questions were answered and players were heads down and ready for a day of intense games. Rounds 2-5 were very similar which was to be expected. A few rulings here and there, nothing that couldn't be handled. By this stage, the players had began bracketing off and the top cut was becoming more visible...However, despite how open and transparent the scoring was, it was still a close call for anyone to make the top 8 cut off. Far from a done deal. The top 8 play-offs were an intense competition. The players had to deal with the added pressure of being watched whilst having the pressure of playing players who had proven themselves by making the top 8. After the nail biting round, the top 4 had emerged and they were all familiar to the top cut scene. Miguel O Riordan, a nationals top 32 player, multiple regionals top finishes and a win was piloting his trusty Geargia deck against an old face, Cian Greaney. Cian, who hasn't played since last year’s Conclave (disappearing off to the woods for a year of solitude, meditation and rigorous training for Limericks most important Yu Gi Oh tournament) has had years of experience, especially with his Lightsworn deck (even before the added boost of the Realm Of The Light structure deck) Cian, however, had a severe disadvantage of not knowing the meta game at all and was unable to figure out the Geargia matchup fast enough , though battling hard, and bringing it to a very close match, he couldn't overcome . Miguel moves on to the Finals! Our second match in the top 4 started a little differently. Walter had been deck checked and had forgot to side out after his top 8 match and receives a game loss at the beginning of his match. This had to put some serious pressure on him however, he was able to overcome Mike Mooney’s unconventional deck choice (Koa’ki Meiru) in game 2 using his Geargia deck (which was very similar to the one he had used at this year’s Nationals which had achieved him second place!) Game 3 was intense but Mike was able to overcome the control capabilities of the tough Geargia match and emerged victorious! The finals was Mike Mooney and Miguel O Riordan. Game 1 went very smoothly for Miguel as he drew all the answers for Mike’s threats and was able to mount a counter that Mike couldn't respond to. Miguel takes game 1! After side decking, Mike begins game 2. Seeing a strong opening, Mike pushes out a very tough board, however, Miguel in his cool headed fashion responds with strong tact and control and is able to regain control of the board. After Mike’s originally threatening field had been dismantled, he struggled to stay in the game and wasn't able to keep up with the quick paced threats that Miguel was presenting and in the end could do nothing. Miguel O Riordan is the Conclave 2014 YuGiOh! Champion! 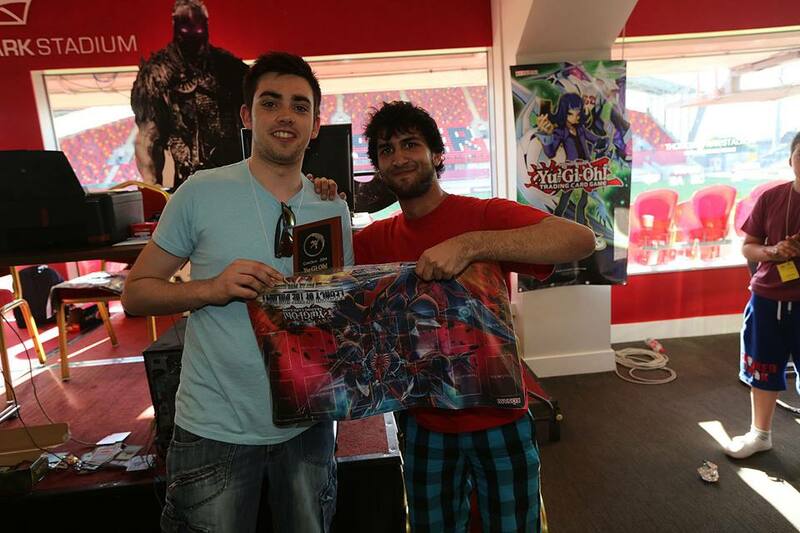 For you Yu Gi Oh fans we have interviews with our two champions from Conclave 2014. Miguel O Riordan the overall champion who netted himself a flight to compete in Italy at the YCS and Matt Bourke who won the under 13’s championship netting himself a matt and some awesome prizes. I caught up with these two regulars after our weekly local Saturday tournament. How long have you been playing you gi oh? Friends were playing it at college, I had played it casually when I was much younger but never seriously. What deck did you bring and why? Geargia, I got the deck two years ago and fell in love with it, recently it returned to form. Will we be seeing Geargia at the YCS or is it a little too soon to tell? They were hit in the recent banlist so they aren’t as good as they use to be so I don’t think so. David Kennedy in the top 8 match his deck had a good matchup against mine and it was a tough game. When your getting into the game, it’s tempting to spend lots of money on the best deck. But you are much better off building a collection slowly and trading for what you need. Looking forward to taking on Italy? How long have you been playing Yu Gi Oh? About 4 or 5 years, getting more serious about it 5 months ago. Well I had watched the tv show, I really liked it. I bought cards and started duelling my Dad. What is your biggest finish to date? This years under 13’s Conclave championship. I brought my usual deck which I bring each week (To the local tournaments), and have been working on it for about two months. Any last words for the people Matt? It was fun when I started off Yu Gi Oh and it still is. I met a lot of new friends in the Gathering and have had amazing duels with fierce opponents. Last year the Gathering put on an event that we felt was similar to the much loved Nationals. This year we are running the “Irish Nationals” again on the 21st of June in Thomond Park, Limerick as part of its annual Conclave. Last year’s event was a great success and we are sure that this year’s event will show improvements! The “Irish Nationals” will consist of a two day event, featuring three rounds of standard and three rounds of draft, and then cut to top 16 for day two. Day two consists of three rounds of draft then cut to top eight, which will be standard. This is reminiscent, though not identical, to original Nationals structure though we are sure it will not disappoint! The winner of the “Irish Nationals” will gain a flight voucher to a European GP/PTQ, as agreed upon by both the TO and winner. Trophies will be provided for both the winner and the runner up, with booster prizes to be given out as normal to players based on their standings. Booster drafts and Standard events can be run on demand, also on Saturday if there are people for it. We will be running a GPT on the Sunday for those that did not make day two. The details of which will be decided closer to the event. If tired of card games on the Sunday we are in talks with the electronics store CEX who want to bring in up to thirty consoles with them. They will be running events all weekend. There will be a fine collection of both board games and people playing them all weekend. Ranging from classics such as Settlers of Catan and Talisman to more contemporary games such as Pandemic and Zombie dice! I would hope to continue the tradition that Thomas Ralph ran for many years at Nationals of “The Magic Quiz” on the Saturday night. Here you can expect questions to both delight and infuriate even the most seasoned veteran. Many conventions have pub quizzes but few can be say that theirs will be in a venue as exciting as Thomond park. The bar will be open until late for all those that wish to attend or just hang out after with a few games! This year Limerick is Ireland’s Capital of Culture while last year a BBQ in Nancy Blakes became the scene of our top 8 this year by cutting three rounds we plan to link in with other Capitol of Culture events to have a great send off to the weekend. We hope to see you there as this year it promises to be a fantastic event! Teams make competitive Magic extremely fun in my opinion, you share in both the elation of winning and the bitter defeat of a loss. This year we are proud to include a team event for our Irish Nationals. This has been included in the price of entry, so why not sign up?! Players may arrange themselves into groups of three at player registration. Each one of these groups may represent anything they wish, be it their play group, the college society that they play in or the shop from which they come from etc. The winners of the team event will be the team with the largest collective points after day one, that is three rounds of standard followed by three founds of draft. We were considering basing it on the two day event but this way people who did not make it through two day two can be included. Prizes for the team event will be customized “Conclave 2014” Polo shirts and a trophy to display in your club for a year. We aim to announce the winners during the quiz on the Saturday night. As always we endeavor to add value for your money and ensure that everyone has an amazing time at the Irish Nationals, so stay tuned for additional updates! There will also be GPT Utrecht, Conspiracy Draft and much more. Returning once again to Conclave Yu Gi Oh which has shown some of the largest CCG turnouts is sure to be just as successful this year. Last year our winner was provided with a flight to the Uk to participate in the YGS London. This year we plan on providing a similar prize we are waiting for the details to later tournaments in 2014 to announce where our champion will be travelling this year. This is a Konami sanctioned event and just like last year there will be lots of juicy prizes to take home. Many thanks to Hazam games for their diligent work and the support they have shown Conclave over the years. Again we welcome back an old favourite of Conclave. After the return of sanctioned organized play for Pokemon in Limerick. We want this years Pokemon tournament to be bigger and better than ever. It may have started all the way back in 1977 but Pokemons imaginative world and mechanics have this game more popular than ever. One of the fastest growing card games, with the success of local tournaments like our Store championships Conclaves Netrunner tournament promises to be a good one. Taking on the role of corporation and hacker who will prove their skill in this diverse and unique card game.